VIDEO: Cavaliers vs. Raptors Game 3 Full Highlights - 2016 NBA Eastern Conference Finals - Balita Boss! The Toronto Raptors took Game 3 of the 2016 NBA Eastern Conference Finals by defeating the Cleveland Cavaliers, 99-84. 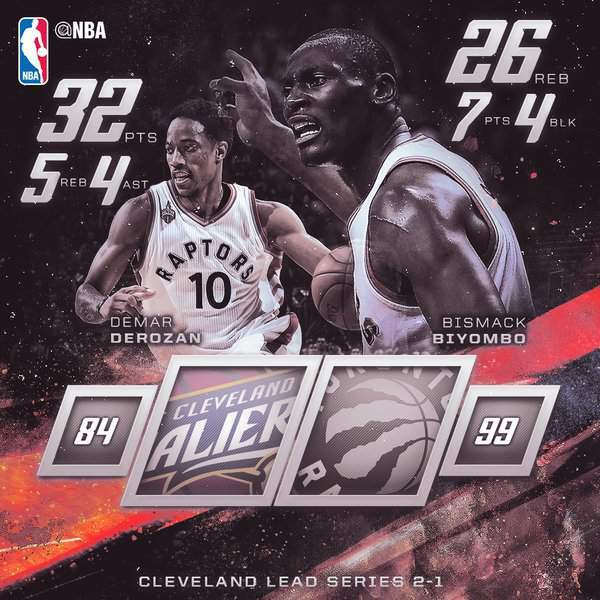 DeMar DeRozan led all scorers with 32 points, 5 rebounds, and 4 assists, while Bismack Biyombo scored 7 points and set a Toronto playoff record with 26 rebounds. Kyle Lowry scored 20 points, Cory Joseph added 14, and Patrick Patterson and DeMarre Carroll each had 10 for the Raptors. LeBron James scored 24 points and J.R. Smith had 22 for the Cavaliers. Kyrie Irving contributed 13 points. Kevin Love scored just three points and missed eight of nine shots. Cleveland still leads the series 2-1 and lost its first game of the postseason after winning 10 straight. Game 4 set for the Air Canada Centre on Monday (Tuesday in the Philippines).